The Colorado-Eagle River Ride returns on Saturday. Cyclists will pedal 42, 68 or 100 miles thought Eagle County with the proceeds going to SOS Outreach. Wednesday afternoon’s thunderstorms postponed the Camp Hale Hup mountain-bike race. Everyone will give it aouther go on Wednesday, weather permitting. BEAVER CREEK — Saturday’s Colorado-Eagle River Ride is the Tour de Roundabout. Arn Menconi, John Edwards and few other cyclists did a route in 2002 that included all of Eagle County’s roundabouts to promote awareness for cycling safety. 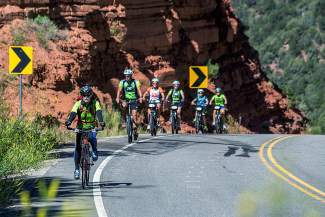 Now in its 15th year, the Colorado-River Ride, benefiting SOS Outreach, will have approximately 700 participants doing their choice of 100-, 68- and 42-mile routes, complete with support-and-gear stations, as well as the new Roadhouse Ride, a mountain-biking division. The Colorado-Eagle River Ride is a fundraiser and a ride with a rolling start from 6:30 to 8 a.m. at Beaver Creek Landing with mountain-bikers starting at 10 a.m.
As happens every year, some will take it out quickly and try to finish the 100-mile route as quickly as possible, and more power to them. But the spirit of the event remains casual for most. • The 42-mile ride goes from Beaver Creek to Eagle and back along U.S. Highway 6. • The 68-miler goes from Beaver Creek to Wolcott on U.S. Highway 6, goes north on Colorado 131 to State Bridge, then hooks over along the Colorado River through McCoy, Bond and down to Dotsero, where shuttle buses take riders back to Beaver Creek. • In the 100-mile route, one just skips the shuttle back to Beaver Creek riding east on Highway 6 to the start/finish. And registration is still available at http://www.sosoutreach.org. All the proceeds of the Colorado Eagle-River Ride go to SOS Outreach, which serves students through outdoor sports and mentorship programs.